Using Google Analytics’ new Universal Analytics, we are actually able to provide more comprehensive data to Yellow Pages New Zealand than when they were using Adobe SiteCatalyst Analytics. The public beta of Universal Analytics was only recently announced, but we have been using it for months and providing feedback to Google to help shape it into an amazing measurement platform/protocol. We are only at the early stages of what will become of Universal Analytics and how it can be leveraged for offline tracking, tracking across device types (e.g. mobile, tablet, desktop), and much more. We will be providing exciting real-world examples of how we are leveraging Universal Analytics for Yellow Pages NZ, but since this is a new product, let’s review the benefits of UA (Universal Analytics) to get on the same page. What are the benefits of Universal Analytics (UA)? New Measurement Protocol: The new protocol defines precisely how you can get data into GA, regardless of your platform. This means, as an example, that if you are a manufacturer of a refrigerator that is connected to the internet, you could start tracking the number of times that the refrigerator was opened and closed; pushing that data from whatever programming language you wish. Get ready for creative uses that leverage the Universal Analytics platform! Cross-device Measurement: If you can identify the user (via userID), you’ll soon be able to track that person as a unique user instead of a unique visitor which was previously linked to a browser/device. Additionally, you’ll be able to see the device pathways that lead to a conversion and how these play into the mix as users hop between devices. At Google I/O 2013, there is a great presentation on this topic and what is coming. Offline Conversions: The ability to leverage the new measurement protocol to bring in data from non-web data sources allows for the tracking of conversions that occur offline. 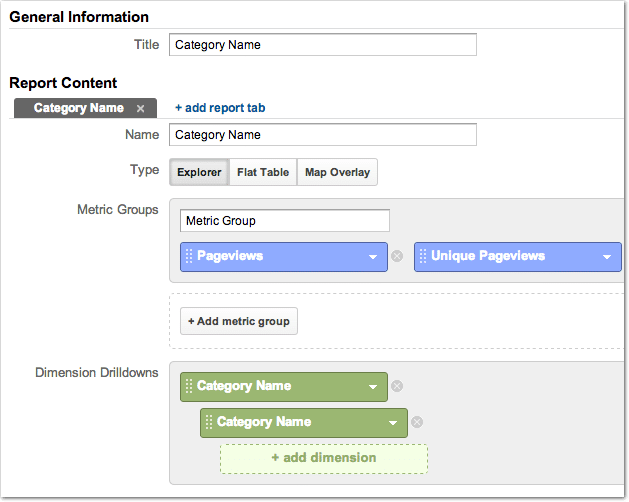 Custom Dimensions and Metrics: These replace custom variables. Instead of having just 5 custom variables, you now get 20 dimensions and 20 metrics (Premium clients get 200 of each!). More benefits on these further below in this post. Flexible Namespacing: This is a feature that has not widely been talked about. You can now control the name of the cookie that UA uses to identify the user (visitor ID). This makes complex multi-tracker situations much easier. Additionally, if they do use the same cookie, you can control other settings at the code-level and in the admin interface about how data is processed. BigQuery Integration: At Google I/O 2013, the Google Analytics team announced an integration with Google BigQuery that allows access to hit-level clickstream data (similar to our Clickstreamr tool but unlike our tool this solution will require Google Analytics Premium). By having the ability to access the raw data, you can combine this with external data sets and answer more complex business questions. More to come: As a benefit of the new code architecture and how data is processed, more exciting features are ahead. How is Universal Analytics Different from the Current Google Analytics? Remarketing is a big missing feature. We are waiting for this to be supported before rolling it out to the majority of our clients. The good news is that according to Google, Remarketing support is coming soon. At Blast Analytics & Marketing, we’ve had access to Universal Analytics for the past seven months under a private beta. During that time, we’ve been working with many of our clients on migrating them to the new Universal Analytics platform. In this case study, we will be highlighting our Google Analytics Premium client; Yellow Pages Group® New Zealand. As a Blast Premium client, Yellow Pages received measurement strategy, fully customized implementation, and ongoing support from our Google Analytics experts; all included in the cost of Premium. Early on during our discovery process, we found that Yellow Pages had unique and detailed reporting needs. Plus, they were also transitioning from Adobe SiteCatalyst Analytics to Google Analytics Premium. NOTE: We support both analytics tools here at Blast, so we were in the unique position of being able to rapidly understand their current processes and code as well as how to transition to Google Analytics Premium. This isn’t the first time we’ve done this or written about transitioning from Adobe SiteCatalyst to Google Analytics. 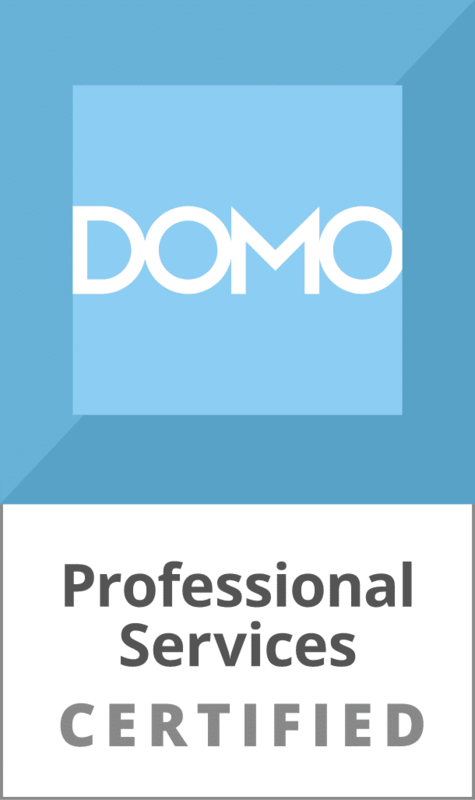 We’ve also performed dual-implementations for clients, implementing multiple tools at the same time or in different order — tool knowledge is one of our unique differentiators. For Yellow, to meet the business requirements, we have to collect a lot of data that the standard Google Analytics tag just doesn’t provide. In the screenshot below, we are looking at a search result page. 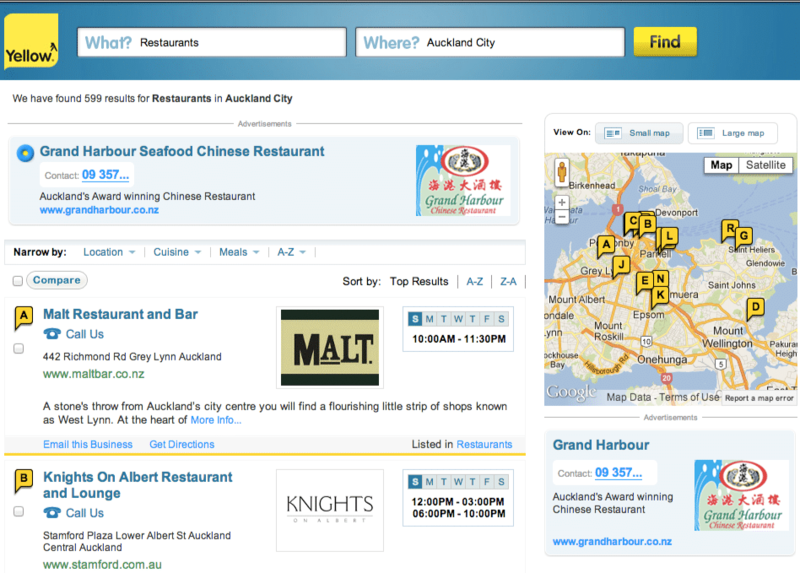 We searched for ‘Restaurants’ in ‘Auckland, NZ’. In a standard Google Analytics implementation, you’d get the URL of this page. Yellow needs to know more. They need to know who is appearing on the search result page, in what order, and what kind of interactions are taking place. Tracking data at this granularity provides their BI (Business Intelligence) team the ability to perform in-depth analysis about each listing and the performance of that listing. We leveraged the new Custom Dimensions feature in Universal Analytics and we were able to meet Yellow’s reporting requirements. The primary advantage of Custom Dimensions is that they are treated as first-class dimensions. Gone are the days when your custom report said ‘Custom Variable Key (02)’ and upon report delivery your management looks confused as to what they are looking at. Now, whatever you name the custom dimension, this is what shows up as the dimension name within the report. It is a very simple change but so helpful! By leveraging Custom Dimensions we are also no longer constrained by the 128 character key-value pair limit of Custom Variables. For Yellow, we often have data strings that are 900 characters and are parsed by the BI tool. Yet another advantage of Custom Dimensions is that we can now filter on them via profile filters. This wasn’t possible with custom variables. Like custom variables, you still have the ability to send the dimension values at different scope levels (now they are called hit, session, and user levels). We can then break this down by other ‘secondary’ dimensions such as search term or what type of search result page (a map result page, etc). We are no longer confined by the built-in capabilities of the Internal Site Search reports and its limit of a single category. Yellow had another unique report request. In their previous implementation of Adobe SiteCatalyst, they were able to report on the number of unique times that a visit (session) interacted with an individual listing. You can interact with a listing by clicking to show their phone number, clicking their website, and more. There are a lot of interactions that can take place that qualify for this engagement. In SiteCatalyst, this is accomplished via event serialization where you must give each event a unique and distinct value. This is most often done by specifying a session ID on top of another unique identifier (listing ID in this case). In many cases within Google Analytics, goal tracking is the obvious solution to provide for this reporting need. You can only convert once per goal per session, so it ends up being unique to the session. Unfortunately, if a visitor interacted with four different listings, the goal conversion would only report a total interaction count of one. This doesn’t meet our objective and we obviously can’t create thousands and thousands of goals! The end result is that we can look at the number of ‘unique events’ at the category level (Listing Interaction) to determine the number of unique sessions that interacted with ANY listing. Further, and more importantly to meet the reporting objectives, we can click into the ‘Listing Interaction’ category and query a specific listing ID to get the number of unique events fired for ONLY that listing ID. If we need more granular data about the type of interaction, we can click into the listing ID and get that data. The ‘unique events’ metric in Google Analytics is always relative to the hierarchy level you are at (it is de-duplicated/serialized). Mission accomplished! The examples above are just a few of the ways that we’ve customized Yellow Page’s Google Analytics Premium implementation to meet their business objectives. We hope that these examples shed some light on the new possibilities with Universal Analytics. As the features in Universal Analytics continue to expand, we’ll be writing several other blog posts that dive into how we are leveraging them for our clients. Let us know in the comments if you have any questions about Google’s new Universal Analytics. And if you enjoyed this post, please +1 and share it! Nice post and thanks very much for sharing the case study. I’m curious as to why user id isn’t mentioned here. I would have thought that Yellow Pages would benefit quite a lot from having UID tracked across sessions, and especially across devices. Did this form a part of the case study too? @google-6f1d227a58a40568a2596bfa685b2c1e:disqus thanks for reading our blog and sharing your comment. There are two reasons why the implementation did not include userId. First, Google has not released this functionality yet. You can do it by setting your own clientId value, but if you were to do that mid-session after a user has logged in, the previous hits for that user would be under a different visitor and it would inflate your metrics. The second reason is that Yellow doesn’t have signed in users. In order to track a user cross-device in the way you mentioned, you have to be able to identify the same user as they move between devices. This is typically accomplished by hooking into an authentication system. As Google continues to release features for Universal Analytics, we will be helping Yellow evaluate the usage of those new features and how they will be of benefit to their business objectives. I want to start yellow pages site but confused to choose a yellow pages script. I found a scripthttp://www.yellowpagesphpscript.com/ is it ok to start yellow pages site? Great post, thanks a lot! I do have a question: were you really able to filter on Custom Dimensions via profile filters? I tried an Include filter for an iPad app, but it doesn’t seem to work. No data is included in my profiles. @Tim, thanks for asking about use in profile filters. For our client we created custom dimensions extensively to build segments, primarily to give us the ability to design custom reports. Being a directory service they wanted to see reports categorized by custom dimensions such as Business Name and Business Level i.e. preferred listing customers, so having the ability to define these new dimensions is going to make managing their big data much easier. Using a custom dimension as a profile filter is certainly an available option, and the available custom dimensions should be listed in the drop-down for Filter Fields. Be sure to check the visit interaction levels as they may alter how you anticipate a dimension behaving within a profile filter. Thanks for the suggestion, got it to work now! I saw yellowpages script.. It has limited features.. when I was surfing for yellowpages script, I found another script called EzyDir that has additional features like yellowpage, b2b, blog, forums, classifieds, theme customization, e-store, job portal and advertisement etc., All features available in one script.